2 A ugust's Commercial Vehicle Outlook Conference focused heavily on new technology entering the trucking industry. Telematics and prognostics led the discussion, but during one of the confer- ence's fi nal sessions the discussion turned to autonomous trucks. Futuristic as the driverless truck may sound, Rich Glasmann, vice president, OEM strategy, sales and marketing at Omnitracs, says hands-free trucks aren't as far away as we might think. 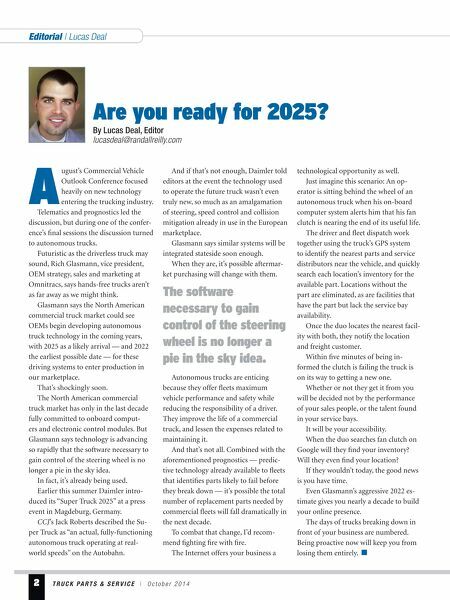 Glasmann says the North American commercial truck market could see OEMs begin developing autonomous truck technology in the coming years, with 2025 as a likely arrival — and 2022 the earliest possible date — for these driving systems to enter production in our marketplace. That's shockingly soon. The North American commercial truck market has only in the last decade fully committed to onboard comput- ers and electronic control modules. But Glasmann says technology is advancing so rapidly that the software necessary to gain control of the steering wheel is no longer a pie in the sky idea. In fact, it's already being used. Earlier this summer Daimler intro- duced its "Super Truck 2025" at a press event in Magdeburg, Germany. CCJ's Jack Roberts described the Su- per Truck as "an actual, fully-functioning autonomous truck operating at real- world speeds" on the Autobahn. And if that's not enough, Daimler told editors at the event the technology used to operate the future truck wasn't even truly new, so much as an amalgamation of steering, speed control and collision mitigation already in use in the European marketplace. Glasmann says similar systems will be integrated stateside soon enough. When they are, it's possible aftermar- ket purchasing will change with them. Autonomous trucks are enticing because they offer fl eets maximum vehicle performance and safety while reducing the responsibility of a driver. 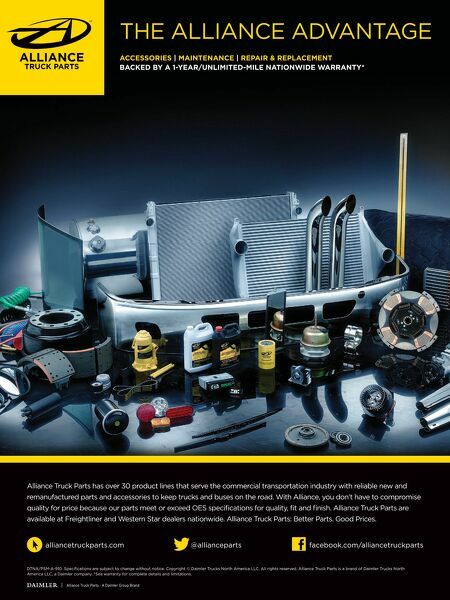 They improve the life of a commercial truck, and lessen the expenses related to maintaining it. And that's not all. Combined with the aforementioned prognostics — predic- tive technology already available to fl eets that identifi es parts likely to fail before they break down — it's possible the total number of replacement parts needed by commercial fl eets will fall dramatically in the next decade. To combat that change, I'd recom- mend fi ghting fi re with fi re. The Internet offers your business a technological opportunity as well. Just imagine this scenario: An op- erator is sitting behind the wheel of an autonomous truck when his on-board computer system alerts him that his fan clutch is nearing the end of its useful life. The driver and fl eet dispatch work together using the truck's GPS system to identify the nearest parts and service distributors near the vehicle, and quickly search each location's inventory for the available part. Locations without the part are eliminated, as are facilities that have the part but lack the service bay availability. Once the duo locates the nearest facil- ity with both, they notify the location and freight customer. Within fi ve minutes of being in- formed the clutch is failing the truck is on its way to getting a new one. Whether or not they get it from you will be decided not by the performance of your sales people, or the talent found in your service bays. It will be your accessibility. When the duo searches fan clutch on Google will they fi nd your inventory? Will they even fi nd your location? If they wouldn't today, the good news is you have time. Even Glasmann's aggressive 2022 es- timate gives you nearly a decade to build your online presence. The days of trucks breaking down in front of your business are numbered. Being proactive now will keep you from losing them entirely. T R U C K P A R T S & S E R V I C E | O c t o b e r 2 0 1 4 Are you ready for 2025? By Lucas Deal, Editor lucasdeal@randallreilly.com Editorial | Lucas Deal The software necessary to gain control of the steering wheel is no longer a pie in the sky idea.